The lymph system is a highway, right? And what are highways for? Transportation! 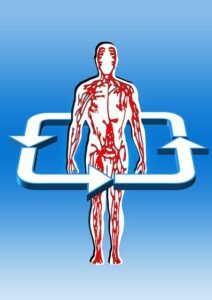 In the case of lymph, it’s a way to transport what the body no longer needs (waste products), dietary lipids like vitamins D and K, proteins and other large molecules, like immune cells. As mentioned before, the lymphatic system picks up fluid in the tissues, helping to maintain fluid balance in the body. If parts of the lymph system are compromised, fluid can build up in the tissues, causing swelling. The lymph system also helps start the body’s immune response! In fact, one important lymph organ (the thymus) is responsible for maturing T-cells and releasing them into the body to fight germs. The right lymphatic duct and the thoracic duct. These two ducts are located above the heart, near the subclavian veins (which are under your collar bones). All lymphatic vessels go one way, toward these ducts so that all the stuff in the lymph vessels can go back into the circulatory system. Way out in your tissues are tiny lymph capillaries that absorb fluids that leak out of blood capillaries. These lymph capillaries lead to bigger roads, known as lymph vessels. These vessels travel near veins, and have lots of valves that prevent the fluid from back-flowing. Lymph vessels have stops along the way, small organs that are encapsulated and anchored in place. These small organs are called nodes, and they are a filter of sorts. They also have immune cells living in them (B cells, T cells and macrophages), that can be called to action when needed. From the nodes, vessels travel to the ultimate goal, the right lymphatic and the thoracic duct. There are two big organs of the lymph system. The thymus, which is found behind your breast bone, is in charge of unleashing mature T-cells. It also secretes the hormone thymosin, which is the substance that turns immature T-cells into the real fighting machines they need to be for our immune system’s arsenal. The spleen is the largest lymphatic organ. It filters blood and lymph and is involved in the immune response. The appendix of the colon has been found to be a part of the lymphatic system as well. It’s not quite the “useless” organ medicine originally thought it was! Mucosa Associated Lymphatic Tissue (MALT) are tissues that form near mucous membranes. MALTs can come and go as needed. They’re like PRN nurses; activity (germs, usually) stimulate their appearance. You can help keep lymph moving freely through your body with a few simple things. Movement! Moving your body has always been an important part of your health. When your muscles contract and relax, it helps pump lymph along its vessels. Hydration is huge for proper lymphatic movement. You need fluid to move all those proteins and immune cells through the lymph, right? So be sure to drink enough water throughout the day. Massage is a great, and super relaxing, way to move lymph back toward those lymphatic ducts. Swedish massage, which is light with movements that aim toward the heart, can stimulate the movement of lymph. Lymphatic massage, which is a highly specialized form of massage that focuses on moving lymph specifically, is recommended for anyone who wants or needs to move lymph fluid back to the lymph ducts. If you have lymphedema, you will want to see a massage therapist who is certified in lymphatic drainage. Hot/cold contrast baths stimulate contraction and dilation of blood vessels, which can help pump lymph along its vessels. Dry skin brushing, which is performed with strokes that go toward the heart, physically encourages lymph to go back to the heart. 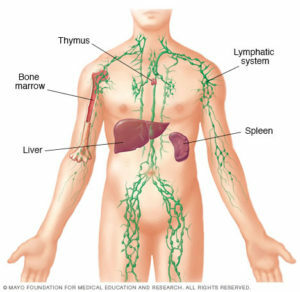 Although there is so much more to the lymphatic system, the basics are fairly easy to understand. Now when your doctor talks to you about some of your lymph nodes or organs, you’ll know what they do! And maybe you’ve learned to appreciate a little more what your body does for you on a daily basis. All these amazing systems and organs working hard to keep you healthy. All they need is for you to do a few simple things to keep them healthy in return.